This just in! 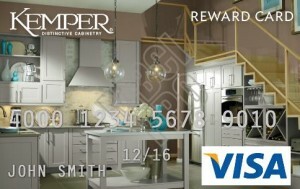 Kemper Cabinets is offering a $500 Visa Reward Card to any client who orders 12 or more of their cabinets between January 5th and February 11th, 2016! **Consumer address MUST be the address where the gift card can be mailed via USPS. DO NOT USE AN ADDRESS FOR NEW CONSTRUCTION UNLESS A MAILBOX IS PRESENT.